The hardy Melba finch is among the most popular of the Estrildidae (an order of approximately 130 species of waxbills and grass finches), but after reading most husbandry accounts, you would quickly abandon any hope of breeding it in captivity. 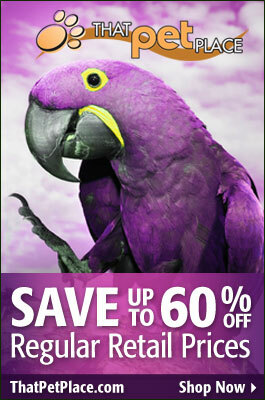 Most authors suggest not even attempting such unless you can provide the birds with a large, well-planted aviary. True, I have observed this bird to breed regularly in huge zoo exhibits, but I also know of hobbyists who have accomplished the same indoors, in surprisingly small quarters. Today I’d like to pass along a bit of what I’ve learned from them. I think that aviculturists often give up on this bird because they fail to realize how long pairs may take to settle in – both to each other and to their cages. Melba finches are quite sensitive and, while new birds may calm down and feed normally, they will not reproduce until conditions are exactly to their liking. 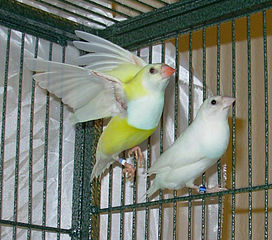 They are easily stressed by conditions that might not phase related finches. 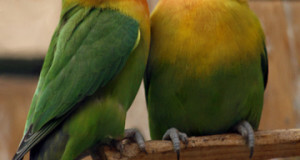 Mature pairs may take 6 months to 1 year before settling down to breed. Under no circumstances should more than 1 pair be housed together – even in large zoo exhibits I have had trouble with aggression. Pairs housed in the same room, but in different cages, may also inhibit one another from breeding… this is less likely if sight barriers are utilized. Native to southern Africa, the Melba finch frequents dry savannas and overgrown, thorny scrub. It forages in pairs or small groups, and does not form large flocks. Males have scarlet-orange to red faces, with traces of red on the breast. The gray underside is marked with white streaks, while the chest, wings and back are olive. Hens are somewhat duller overall, and lack red coloring on the face. Adults top out at 5 inches in length. A colleague who bred Melba finches in a small, standard-sized finch cage identified an increase in humidity and insect food as keys to her (or the birds’!) success. This makes sense, as budgerigars, cockatiels and other finch species hailing from arid climates are stimulated to reproduce by the onset of the rainy season (or even a passing storm). Humidity can be increased via a small room humidifier, but several contacts have reported that daily misting with a water bottle works just as well. I have noted that many zoo birds respond to seasonal “rains” delivered via a morning and evening hosing of their exhibits, so misting could well deliver the stimulus needed by caged finches. Check out an excellent picture of a Melbra finch here. Click: Breeding the Melba Finch (Green-Winged Pytilia), Pytilia melba – Part 2, to read the conclusion of this article.